When I did my Sound post a few weeks back Tracy commented that she would like to see a Crispy Ambulance post in the future. 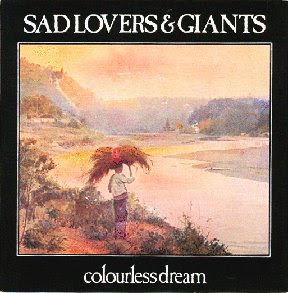 Well, I had fully intended on granting her wish, and may still do so in the future,however, I have decided to drop this single by a much lesser known early 80's moody/dark wave bunch of bastards...SAD LOVERS & GIANTS , who existing from 1981 - 1984. Between these dates they released four singles and two LPs and recorded a John Peel session. The single I am presenting here is their 2nd single that was released in 1981. I hope you enjoy, and I hope this post does not disappoint Tracy. S L&G are no Crispy Ambulance, but they certainly hold their own and deserve a listen in my opinion. Dave G.
Dave - are all their songs instrumental? I still want a Crispy Ambulance post darn it!!! !